I so get it!!!!! and I can so relate!!!! 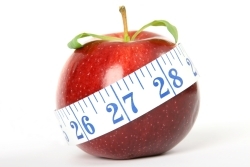 I have no idea why losing weight is so darn difficult the older you get. They say it’s a decrease in energy level……. They say it’s just old age………….. I was out shopping, and this magnet caught my eye. I knew it was destined to find a home on my refrigerator. 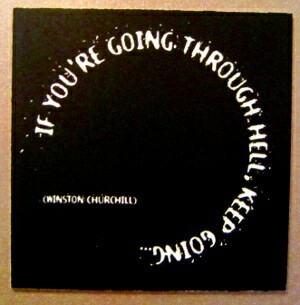 Wise words to remember by Winston Churchill. 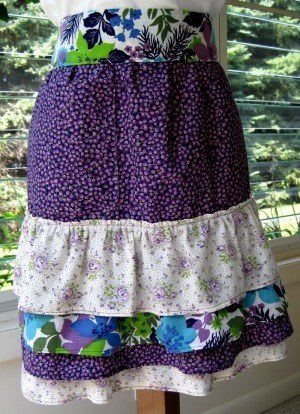 This purple ruffled apron was inspired by a duvet cover of my grandmothers. The purple small floral fabric (duvet cover) was in a box of old linens that were stored at my mothers. After throwing some fabrics together…………voila! this sweet apron came to life…and is looking for a home on etsy.